The government agreed on the 2018 theme of “Discipline, integrity, action, innovation and effectiveness” with the aim of achieving a 6.7 per cent GDP growth. With the results achieved over the past year, the formation of an increasingly attractive business environment has never been expected as much as now. 2017 was seen by the business community as one of the most important milestones in the Government’s efforts to create a business environment conducive to business development. The resolution to build an enabling government of action, support, integrity, and service for development is being clearly shaped from policies issued to actions taken. Many important resolutions have been adopted and enacted, including Resolution 19 and Resolution 35. 2017 was known as the year of reducing costs for businesses. The Government and the Prime Minister have always paid due attention to the reform of administrative procedures, the simplification of business conditions and the reduction of business inspections and examinations. The Prime Minister’s Working Group has regularly urged and inspected tasks performed by ministries, branches and localities. The directives of the Government and the Prime Minister have been gradually spread to ministries, branches and local governments at all levels. Meetings and dialogues with businesses have been organised regularly and continuously at various levels and branches. A lot of difficulties of enterprises have been removed by relevant agencies and sectors. Many ministries and sectors such as the Ministry of Finance, the Ministry of Industry and Trade, the Ministry of Agriculture and Rural Development and the Ministry of Science and Technology have taken the initiative in reviewing and adopting many plans to reform business conditions, simplify procedures and reduce specialised inspection procedures to facilitate enterprises to make investment and do business. In general, these efforts have been building up the confidence of the business community. The number of new business start-ups, corporate operation resumptions and business capital value has increased dramatically. Vietnam witnessed 153,307 companies establish or resume business operations in 2017, including 126,859 new entities and 26,448 suspended units that resumed operations. A total of VND3,160 trillion was injected into the economy in the year, including VND1,300 trillion of greenfield investment capital and VND1,860 trillion of added investment capital. Corporate establishments and registered capital set the records in 2017. Compared with 2011, new start-ups and registered business value in 2017 increased 1.6 times and 2.5 times, respectively. International organisations also recognised Vietnam's efforts for a better business environment. The World Economic Forum’s (WEF) Global Competitiveness Report 2017 - 2018 ranked Vietnam 55th out of 137 economies, a jump of five places from the previous rankings and 20 places in the latest five years. The country’s rankings in the World Bank’s Doing Business leaped 14 places to 68th place out of 190 economies. However, many enterprises are facing hardships in production and business operations. As for active firms, troublesome administrative procedures burden their production and business activities. In order to make further robust improvements in the business environment and the national competitiveness, the Vietnam Chamber of Commerce and Industry (VCCI), based on opinions of the business community, has actively compiled specific recommendations to the Government, ministries and branches. VCCI believes that further reform of business conditions and administrative procedures will be required, first of all focusing on reforming conditional business sectors, simplifying specialised inspection procedures and cutting costs for businesses. 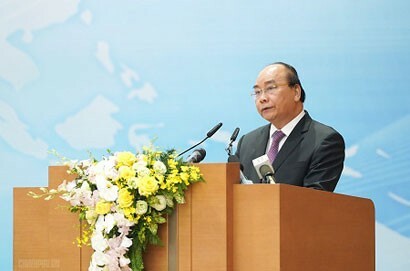 In the early days of 2018, the Government requested ministries, branches and especially localities to concentrate on improving business environment indicators, carrying out solutions to strongly raise business indexes, to enhance labour productivity and competitiveness in each branch, each domain and area under their administration to bring Vietnam to the ASEAN-4 group in terms of competitiveness and business environment. The era of the Fourth Industrial Revolution has begun with appearance of many new industries. Reform for higher labour productivity is an inevitable trend in the world. Thus, the Government of Vietnam needs to place development and innovation as a central economic strategy and support it on the national scale. In particular, increasing labour productivity by renovating small and medium enterprises and service industries is more important than ever. To do this, it is necessary to revise some relevant laws and provide more budget support for industrial restructuring. The government should expand R&D budgets for small and medium businesses and start-ups. At the same time, industry and education should be respected. 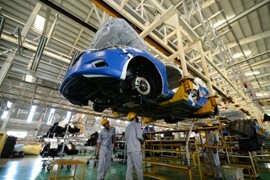 In order to renovate industry, big domestic enterprises and foreign firms need to coordinate in action. Leading companies should actively upgrade new industries, increase R&D investment in new technologies, and support small and medium enterprises to develop new technologies. Most importantly, the Government needs to improve inappropriate regulations that impede investment and increase excessive burdens on enterprises. It needs to quickly resolve actual difficulties in order to accelerate production activities. At the same time, it should minimise regulations on environment that harm industrial competitiveness of enterprises. US President Donald Trump's visit to Vietnam highlighted great opportunities for American businesses in Vietnam. However, we often see investment opportunities that cannot come into fruition because of problems that we face when we confront corruption, institutional environment and cumbersome and unclear licensing procedures. In addition, some sectors in Vietnam have not been open, or remain restricted to the private sector, because focus is still placed on the public sector and State-owned enterprises (SOEs). We believe that opening the door to attract private capital for major projects will help improve the overall financial health of the country. The quality of Vietnam's working environment and, perhaps, the quality of people’s life depend on the environmentally friendly and reliable infrastructure. Vietnam is clearly in urgent need of private capital to address the growing supply shortage of electricity to demand. AmCham believes that the made-in-Vietnam energy source conservation plan is a sustainable plan by finance, environment and supply chain, where emphasis is placed on efficiency, renewable energy and gas. If the Government intends to build a feasible regulatory framework and a market-oriented electricity pricing roadmap within the next five years and if donors focus on risk reduction, disadvantaged groups, and investment in power transmission network upgrading and if the private sector focuses on production and enhance power efficiency, we believe that Vietnam will be able to get billions of US dollars of private funds that Vietnam is in dire need for in this field. 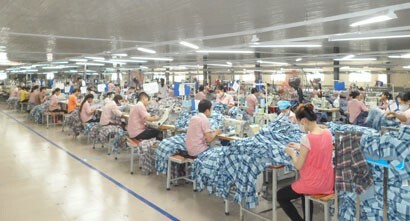 The government has started a serious campaign to cut business costs for Vietnamese companies by approaching a broad audience at the same time, including businesses, professionals and authorities. Once successfully enforced, these policies will reduce unnecessary costs and make domestic products more competitive and people's livelihoods better. There are three main sources that are currently not being effectively exploited in the following order of importance: Corruption of government staff, protectionism and law inconsistency. First of all, we call for the Government's efforts to reduce the opportunity for corruption and handle corruption cases. At a lower level, the leverage solution is paying a decent wage to them, directing them to the pride of their service to the government and people around them. Meanwhile, at a higher level, the dilemma lies in the lack of transparency, over-reliance on licensing and certification procedures, give-and-take mechanism, and decision-makers’ subjective interpretation of regulations. Protectionism forces local companies and governments to pay more or inhibits them from having better, safer and more reliable goods and from being equipped with enough knowledge, training and service delivery. Finally, it is necessary to reduce overlapping or contradictory requirements imposed by administrative bodies that give rise to financial or tax waste on the one hand and oblige staff to prepare unnecessary documents on the other. First of all, on behalf of all Japanese companies in Vietnam, I would like to show respect to the success of APEC 2017. APEC got success as forward-looking diplomatic negotiations among countries, with APEC leaders including Japanese Prime Minister Mr Abe, US President and leaders of China and Russia. This success gave Vietnam a brilliant achievement medal from the global community. I am honoured that Japan was able to support APEC's operation. Also, in Japan's position, it is great significance that a broad agreement on CPTPP 11 was made with strong leadership of Japan and Vietnam. In 2017, we evaluate that various policies of Vietnam were successful and steadily achieved economic growth supported by the global economic boom. I think that the 6.81 per cent growth rate of GDP above the target indicates that. In other words, the results of the industrialisation strategy and the active promotion of market openness and free trade led by the Vietnamese government surely have demonstrated the effect. Among them, attracting foreign investors through improvement of the business environment has been effective. Also, I think the fact that Japan was the number one country among foreign investments is shown that the very close relationship between Vietnam and Japan has become better and better. We recognise that the business environment of foreign enterprises including Japan in Vietnam has definitely improved. The Vietnamese Government has actively established dialogue channels for Japan including JBAV. Through sincere and frank communications at these channels, we will cooperate to improve the business environment for foreign companies under the leadership of the Vietnamese government. The Japanese Government and Japanese companies have been strongly supporting economic growth in Asian countries including Southeast Asia through our past experiences, high technical skills and excellent field operations. We recognise that the roles of Japan and Japanese companies become greater than ever for Vietnam's further and sustainable growth. Also for Japan, I would like to reconfirm here that Vietnam is a very important partner and a wonderful friend. Among referral channels for FDI investors, the Provincial Competitiveness Index (PCI) surveyed and published by VCCI is considered an important reference for their decision on project investment in a locality. This shows that the positive and active engagement of local authorities in improving the business and investment environment and investment promotion plays a very important role. Investment promotion is very important, but it must be professional and substantial, especially in the context of limited resources. The best way to promote investment is combining with investment support because many localities receive disappointing results after boisterous promotion activities when investors faced hardships in real life. In fact, in the investment attraction race, localities only can have advantages with their own efforts. Positively, many have understood that investment promotion means following the footstep of investors and changing their give-and-take perception to their true service to investors and businesses. Accordingly, it is important to take care of every single project after it is licensed. This is a very effective way to draw true enterprises. Promoting the local image and investment environment will become most effective when using effective supports and care to enterprises and investors after investment licensed are granted as the gauge of performance. For businesses, practical experience and success of first-comers will be more convincing evidence than any investment promotion programme.